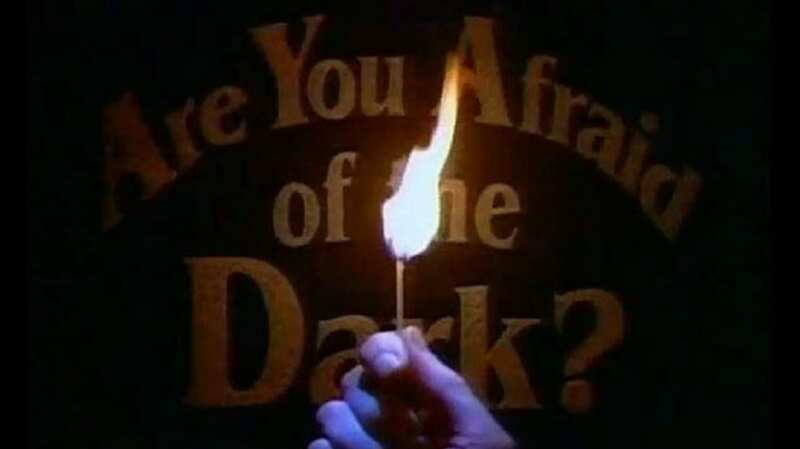 15 Frightening Facts About Are You Afraid of the Dark? Are You Afraid of the Dark? is the reason why '90s kids might look back at their Saturday nights with a little bit of terror. The anthology horror series, which closed up the SNICK block of programming, must have cost millions of children precious hours sleep with the scary tales presented by The Midnight Society under the cover of darkness. Submitted for your approval, here are some facts about the classic Nickelodeon series. 1. NICKELODEON DIDN'T WANT IT FOR OVER A YEAR. Creators D. J. MacHale and Ned Kandel unsuccessfully pitched the series to Nickelodeon, who told the two that scaring children was a non-starter. One year and network hiring of an executive named Jay Mulvaney later, the two tried and failed again to sell a different show. But Mulvaney, who had read a three-page treatment of Are You Afraid of the Dark? and wondered why the network had passed on it, asked MacHale and Kandel if they were still interested in making their original idea. 2. ITS TITLE WAS INSPIRED BY DR. SEUSS. 3. THE THEME WAS COMPOSED IN AN AIRPORT. Jeff Zahn was waiting for his plane to arrive at the airport in Montreal when he just started to sing the theme. "I just thought about the series, about mystery, hauntings, scary, supernatural things, thrillers—and kids—and it came to me," Zahn told Art of the Title. "I didn’t have music paper, so I scribbled out the notes on a napkin. I really liked it and kept singing it. Then when I played it on piano the important countermelody came to me, which I used as an introduction and for linking material. It came together very quickly and easily, unlike a lot of other themes I’ve done." 4. NICKELODEON PUSHED FOR A DIVERSE, "NON-DISNEY" CAST. Diversity was such a strong mandate at Nickelodeon that the series ended up being nominated for an NAACP award. Nickelodeon also turned away kids if they were "too Disney," which MacHale described as "apple pie, freckles, cute, over-the-top acting." 5. MACHALE GOT THE CHICKEN POX FROM AUDITIONING KIDS. MacHale traveled to Vancouver, Toronto, New York, and Montreal to fill out the show's cast. After a trek to Vancouver, he came down with the chicken pox. He was quarantined in Montreal for 10 days. 6. RYAN GOSLING TURNED DOWN JOINING THE MIDNIGHT SOCIETY. MacHale wanted to hire Ryan Gosling, but he chose to join the now legendary The All-New Mickey Mouse Club cast, alongside Britney Spears, Christina Aguilera, Justin Timberlake, and Keri Russell instead. Gosling did, however, guest star in the episode "The Tale of Station 109.1." Plenty of other future stars appeared on the series, too. 7. NONE OF THE CHARACTERS EVER ACTUALLY LIT THE CAMPFIRE. All of the Society's fires were already lit when the audience joined the action because Nickelodeon didn't want to educate the kids watching at home on how to strike matches. In the one episode where a character was allowed to light a lantern, the actress, Mia Kirshner, didn't know how to do it. 8. THEY SHOT AN ENTIRE SEASON'S WORTH OF MIDNIGHT SOCIETY SCENES TWO TO THREE WEEKS AT A TIME. Ross Hull (Gary) recalled that 13 episodes were shot over a "two to three" week span. Elisha Cuthbert, who was a part of the second group of Society kids, had a similar experience. "It was interesting for me and everyone in the Midnight Society because we would shoot all of our scenes back to back in two weeks, and then we wouldn’t do it again until the following year," she said. 9. NICKELODEON WANTED THE STORIES TO BE BASED ON CLASSIC HORROR TALES. 10. SOMETIMES THE LOCATIONS WOULD INSPIRE THE STORY. "There was an episode we did called ‘The Tale of the Hatchet,’ which was about a private boarding school that turns out [laughs] it’s run by lizard people," MacHale said. "In the basement of the school there were these giant tanks with floating eggs, where the lizard people were nurturing all these little monsters. That came from the fact that this location scout took me to this water purification plant from the ‘30s where all these tanks were, and I thought, ‘Ooh, I can build a story around this.’"
11. THE MIDNIGHT DUST WAS NON-DAIRY CREAMER. The "midnight dust" that Society members tossed on the campfire while introducing their stories was a non-dairy creamer (and it reportedly burned). Daniel DeSanto (Tucker) did not know the secret until he joined the cast. "I came on third season and I was so excited for the magic dust used in the fire. But it’s just a bag of CoffeeMate and glitter. The fire was a pyrotechnic trick." 12. THERE WAS A CHANGE WITH GARY AFTER THE FIRST SEASON. Ross Hull had to take the lenses out of his glasses because it was catching the reflection of the studio lights. 13. THEY SHOT IN REAL CEMETERIES, BUT WITH FAKE NAMES. There are laws against showing real names on tombstones, so foam ones with phony names were used when necessary. This fact did not ease editor Paul Doyle's paranoia. "I remember working very late one night, bleary-eyed, cutting a scene from a graveyard," Doyle said. "The camera creeps among the tombstones with a rolling fog and comes to rest on a tombstone reading, 'Here Lies Blind Paul.' I burst out laughing and the assistant editor came running in to see what was the matter. To this day D.J. [MacHale] denies that he was commenting on my editing." 14. MOSQUITOES WERE A SERIOUS PROBLEM. A Montreal arboretum allowed the show to film the "deep, dark woods" scenes on their premises, but they did not permit the use of any mosquito-killing insecticides. This resulted in the crew having to actually wear beekeeper outfits and gloves. Several takes through the years were dumped because a mosquito would bother an actor. 15. 'THE TALE OF THE NIGHT SHIFT' WAS MEANT TO BE THE SERIES FINALE. It was the only episode of the series where the Society fire was not put out in the end. The hospital room door in the final shot had the number 65 on it because it was the 65th episode. "In that same shot, if you listen closely, you can hear the Dark theme coming from the hospital room," MacHale said. But after an almost three-year drought with no new episodes, another two 13-episode seasons were shot.